I love a recipe that uses real fruit as the main sweetener. This banana sweetened, grain-free and sugar-free banana cupcake recipe is one that my family really enjoys. 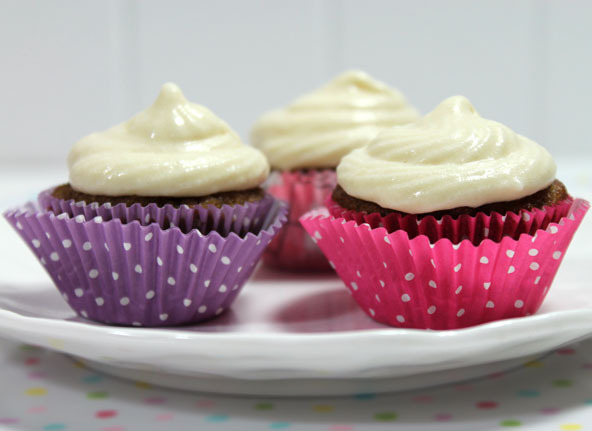 My Chocolate frosting recipe goes well with these Banana Cupcakes but this time I decided to try to put together a cream cheese frosting for it. I don’t love cream cheese and rarely ever use it but I knew it would go well with these cupcakes so I thought I would give it a whirl. It worked out quite well. In a medium mixing bowl, beat the eggs, butter or oil and maple syrup with electric beaters. Puree the bananas in a blender. I like to use a mini bullet blender for this. If you mash the bananas with a fork in a small bowl or use the electric beaters, it will not be a puree which is also fine if you like small banana chunks in the cake. Add the blended banana to the mixture along with the remaining ingredients. Blend together until well incorporated. Taste the batter. If your bananas were not ripe and sweet enough you might want to add 3-4 drops of liquid stevia to help sweeten. Pour mixture into greased (with coconut oil) muffin tins or place paper cupcake liners or silicone cups into the muffin tin and fill ¾ of the way up. Heat oven to 350 degrees and bake mini cupcakes for 15-16 minutes and medium cupcakes for 22-23 minutes. Make sure the cream cheese and butter are at room temperature and soft before starting or the frosting will be lumpy. Using electric beaters, blend everything together in a medium mixing bowl until perfectly smooth. Taste it and add a few drops of stevia if you like it sweeter. Note that the more honey or maple syrup you add, the thinner it will get and it will keep it from stiffening up when cold.